Designed for scouting and infiltration, an all-encompassing hatred fills the black heart of this unfathomably evil Kreature. Despite its small size, it has the sheer audacity to attack and sometimes drive away opponents much larger than itself, and has been known to kill even when it isn't hungry. Its vicious nature makes it uncharacteristically difficult to tame for a low ranking Kreature. 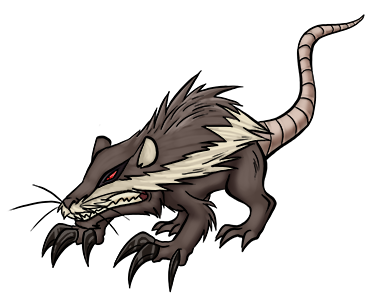 Swarms of feral Shrewverines will scavenge rotting carcasses and reduce them to skeletons within minutes. Congrats on your 100th comment! I appreciate your readership and look foreword to more!